Division shortcuts are very much helpful to save time in all our exams. As well as it will improve our analytical thinking. 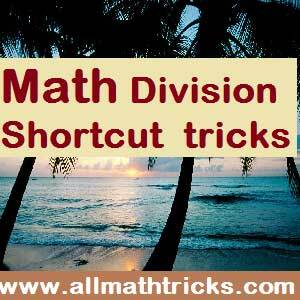 In this page we provided some examples of division shortcut methods. Division process simply says as it is arithmetic operation of equal parts distribution of a number. If we have 10pens and it is to be distribute equally to 5 persons then each person get 2 pens (10/5 =2 ). So Division is the just inverse of the multiplication process. First we know about some terminology like divided, divisor, Remainder, quotient in division math. 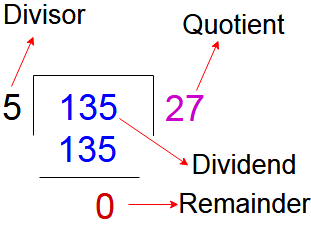 (Quotient × Divisor) + Remainder = Dividend. Divisibility Rules for easy calculations of mathematics. Now we discuss examples of shortcut division methods. Method – 1 : The dividend number in the given sum split as per our convenience. It is purely depended upon the our analytical thinking ability. Example -1 : 25623 ÷ 168 = ? First think about how to split the dividend in simple parts as per the given divisor. If you wont more accurate then go for next step. Here provided diagram for better and easy understanding of division shortcut. Example -2 : 5821 ÷ 109 = ? Example -3 : 82146 ÷ 24329= ? If given sum having five digits then cut the lost two digits from both divisor and dividend. It will not effect much more on final answer. Now calculate only for 821 ÷ 243. Method – 2 : Division trick for numbers 5, 25 and 125 in place of divisor. Example – 4 : 269874 ÷ 5 = ? Example – 5 : 5697823 ÷ 5 = ? Now simple we doing the dividend multiplying by 2 and put decimal point before the lost digit of quotient. So 5697823 ÷ 5 = 1139564.6. Example – 6 : 56824 ÷ 25 = ? Here we apply the simple logic i.e 25 = 100 / 4. So simple we doing the dividend multiplying by 4 and put decimal point before the lost two digits of quotient. Example – 7 : 23579 ÷ 125 = ? Here we apply the simple logic i.e 125 = 1000 / 8. So simple we doing the dividend multiplying by 8 and put decimal point before the lost three digits of quotient.